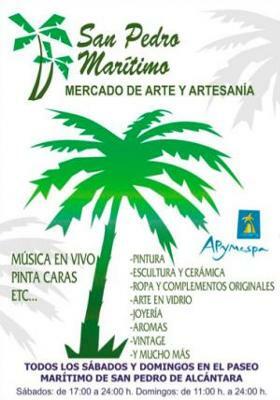 San Pedro de Alcantara is holding an Arts and Craft Market on the San Pedro beach boardwalk every Saturday and Sunday in the summer under the name "San Pedro Marítimo". This event intends to replicate the "Bajo los Naranjos" art and craft market held in Marbella Old Town on Sundays. The San Pedro artisan market is held in the summer on Saturdays from 5:00pm and on Sundays from 11:00am until midnight (on both days). This market hopes to enhance the general atmosphere on the boardwalk as well as give a chance to local entrepreneurs to sell their products. This event will feature bands, activities for children and also once a month will take place involving a social and community role for San Pedro. Loads of fun, activities and things to buy such as sculptures, ceramics, clothes, accessories, glass art, vintage items, perfume, jewelry, facepainting, live music and much more. I was on the San Pedro beach boardwalk last Sunday and saw them setting up for this market, so it looks like it continues throughout the winter. One of the vendors told me she goes to the Zoco del Sol market in Marbella on Saturdays, so I'm not sure if the San Pedro arts and craft market is running on Saturdays in the wintertime. The San Pedro beach boardwalk is also known as the Paseo Maritimo de San Pedro. You can find a link to a map on our page on San Pedro beaches. Just click on the link for the location. The boardwalk is right along the sand and is a great place to take a walk, ride a bike and have a bite to eat at any of the restaurants. If you start at San Pedro center, just head south (downwards) until you hit the beach. You shouldn´t miss it. CAN YOU GIVE ME THE CONTACT DETAILS OF THE ORGANISERS PLEASE.